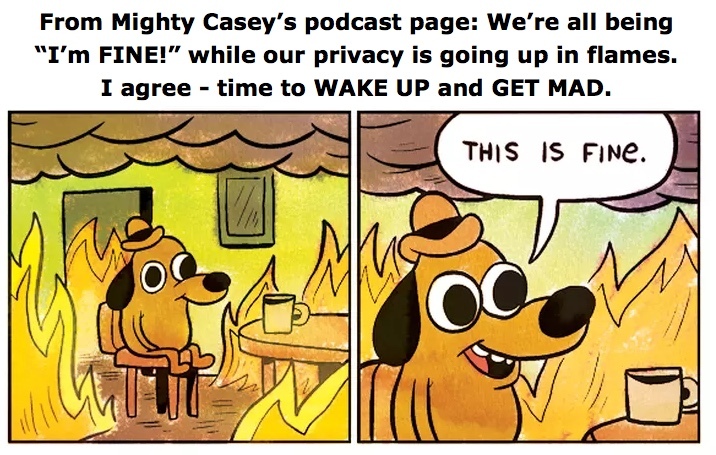 Listen while hilarious Mighty Casey lays out my “why I ditched FB” in 18 tense minutes. Last month I suspended my Facebook activity and posted “Facebook, I’m out. Your irresponsibility with patient groups has gone too far.” It’s been hard because 87 times a day I think “I gotta pop this on FB” or “I wonder what my daughter’s up to” or some such. But I am pissed, pardon my French, because these guys (including Sheryl Sandberg etc) are being totally irresponsible, and yet Zuck continues to wear his innocent face. They’re lying. Even as the evidence keeps coming out week after week, they keep putting on sanctimonious “We want to bring the world together” crap. And if you saw the FB movie The Social Network, which Zuck himself approved, you know it actually started (despite recent testimony and statements to investors) to rate chicks. Period. And then they got billionaire fever, which didn’t help improve those frat-boy ethics one bit. They’re lying. They’re abusing trust, have been doing it for years, even giving snoopy companies tools to do it with and only apologizing when they get caught. ANYWAY, one of my most outspoken friends in healthcare is Mighty Casey (web, Twitter), a cancer survivor herself who also gained many years of bitter experience dealing with the healthcare system as primary caregiver for each of her parents in their final years. And yet – because she’s also an occasional standup comic – she has still maintained her sense of humor through all this (peppered with appropriate outrage). Having also been a network news production nerd for decades (I know, right??? All this in one person??) she’s also kept an amazing list of all the cuss-worthy @#^kery FB’s been in the news for in the past year. And having started a podcast called Healthcare is HILARIOUS! because she has nothing better to do, she just did a bang-up job of summing all this up. Most of her episodes have multiple segments including a review of the week’s health news, but this one’s just this whole Facebook privacy violation and secrecy mess in 18 minutes. Please listen, and encourage friends to. Remember: this all started hitting the news because of the Cambridge Analytica uproar, in which FB was just plain careless and negligent about what might happen if their marketing-helper technology got misused. And around the same time we started discovering they were helping marketers (secretly!) dig out the names of people in private (“closed”) patient groups. It’s scummery, and lord only knows what those people have already done with that data. Resist.